The Jersey United Banks women's rugby team are looking for new recruits ahead of their second season in the National Challenge One league. Jersey Ladies formed in 2006 are the only women's team in the island, joining the national leagues last year. 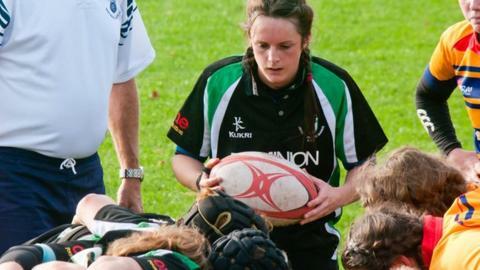 "We have around 14 games a season so we need as many girls as possible," prop Sara Felton told BBC Radio Jersey. "We're not convinced that there's only 25 women on this island that want to play rugby, we're sure there's more." After playing the occasional friendly for the first couple of years, they eventually met the criteria to join the league structure. "We were put in a slightly higher league than we were anticipating, so we were expecting things to be tough. "We didn't want an easy ride, we wanted to be pushed as hard as we could and as a consequence we finished mid table," she added. They have set up links with Jersey RFC and have had some of the Championship's professionals helping with coaching. "There's a great coaching structure in place so any new people won't be thrown in the deep end," she added. "There are people that can take you to one side, explain the game and break it down. You're not going to be chucked in with your boots and your gumshield and expected to just crack on. "There's a misconception that you have to be absolutely massive, really strong and a bit burly. The thing I love the most about rugby is that it welcomes everyone into it and there's a position for most people in the game." League action begins in three weeks' time and Felton is urging any women who may be interested in taking part to come up to the Grainville training ground on a Wednesday evening. "Come up to training and don't be scared, you'll see how welcoming the team are."